I honestly didn't have any expectations going into this one. I wasn't sure what it was going to be like, I had no idea what the mystery would really entail. I definitely didn't expect the story to go where it did. And while I can't say that I loved The Leaving, I can say that I enjoyed it. The story begins at a playground, where five teens are dropped off by a van with a missing tail light. They each know who they are, and what there names are, but they barely remember the others. And they don't remember anything prior to being dropped off. They each find a map in their pockets, sending them in different directions, and nothing else. Not knowing what happened, they decide to follow the maps, and plan to meet up the following evening to hopefully figure things out. After going their separate ways, and finding themselves at barely recognizable homes and completely changed faces, they learn they have been missing for eleven years... and one of them, the sixth, didn't return home. So begins the journey of finding out the truth of what happened all those years ago, and trying to bring the last of the kids home. 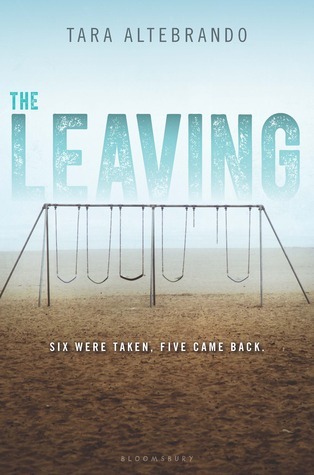 The Leaving is told from the perspectives of two of the returned, and the sister of the missing child, Max. We get to see the vast differences between being the taken, and a loved one of the taken. And also the similarities. Scarlet and Lucas want to figure out the truth of what happened, and what is hanging between them. Avery just wants closure. She has been living a life in Max's shadow, and she is ready for answers either way. She doesn't believe that eleven years are missing from Lucas and the others memories. And she is determined to find the truth. Along the way, they each gain friends, lose even more of their families, and find something to cling to. I enjoyed this book, mostly. I liked the mystery that was presented, and trying to piece together all of the clues to form a complete picture. I was still desperately piecing by the end, with no idea what the result would be. Aliens? Government conspiracy? It could have gone either way, and I would have enjoyed this aspect. The writing was also a positive point. It flowed well, and wasn't rushed, so I was able to fully immerse myself in the mystery of the Leaving. What I wasn't such a fan of were the characters. They weren't badly written, nor too evil to really enjoy, they just weren't very.... relatable, maybe? Avery was hard to like a lot of the times. She was very selfish, and thought some really crappy things about her best friend. But I also felt sorry for the situation she was in, and can only imagine what it was like growing up in her missing brothers shadow. Lucas was probably my favorite of the characters. His character was very raw and very real, and he was the only one that I felt a true connection to. Scarlet wasn't a bad character at all, and I felt for her situation with her mom, but I just never felt that pull with her. The other returned were written well, and had distinct characteristics, but there wasn't enough of an interaction with them to really root for them. They were various other secondary characters that were well-placed in the story, each well-written, with specific reasons for being a part of the story. I just wish that one of them had stuck out enough to really grab and hold my attention. Tara Altebrando has a great writing style, and one that I enjoyed. The Leaving was hit or miss with me, but I enjoyed it well enough to check out other stories by the author. I would definitely not hesitate to recommend this one to you. If you like a little mystery, with some sci-fi-y aspects, then give this one a chance.